A small or medium-sized tree, up to 35 feet tall with a short, often crooked trunk to 12" in diameter, and a horizontal branching habit that forms a rather flat and spreading crown. In East Texas forests and woodlands, usually on well-drained soils under the shade of larger trees. Planted widely as a landscape tree, where it blooms best in full sun. Simple, opposite, 3" to 5" long and 1.5" to 3" wide, oval to almost round in shape, long-pointed, leaf edge wavy but without teeth, veins prominent and following the leaf margin; leaves are dark green above, grayish beneath, turning brilliant shades of red and purple in the fall. Emerging before the leaves from the round, gray, winter buds, as a dense head of small, greenish-yellow flowers surrounded by 4 large, white (sometimes pink) petal-like bracts, the entire flower cluster measuring 2" to 4" across. A cluster of bright red drupes, each about 0.5" long, egg-shaped, and containing a hard nutlet with 1 or 2 seeds. The fruits are relished by birds, squirrels, and other animals. Gray to black, smooth at first but breaking into small, square blocks with shallow fissures. Heavy, hard, and strong, close-grained, brown to red in color. Formerly used for turnery, handles, and other woodenware; now used most often as a landscape specimen. Roughleaf dogwood (Cornus drummondii) is a shrub with rough-textured leaves and white fruit clusters. Christian lore holds that the cross on which Jesus was crucified was made from a dogwood tree, which in that time was a stout, straight tree; God decreed that the dogwood tree would from that day forth never grow large enough to be used to make a cross. 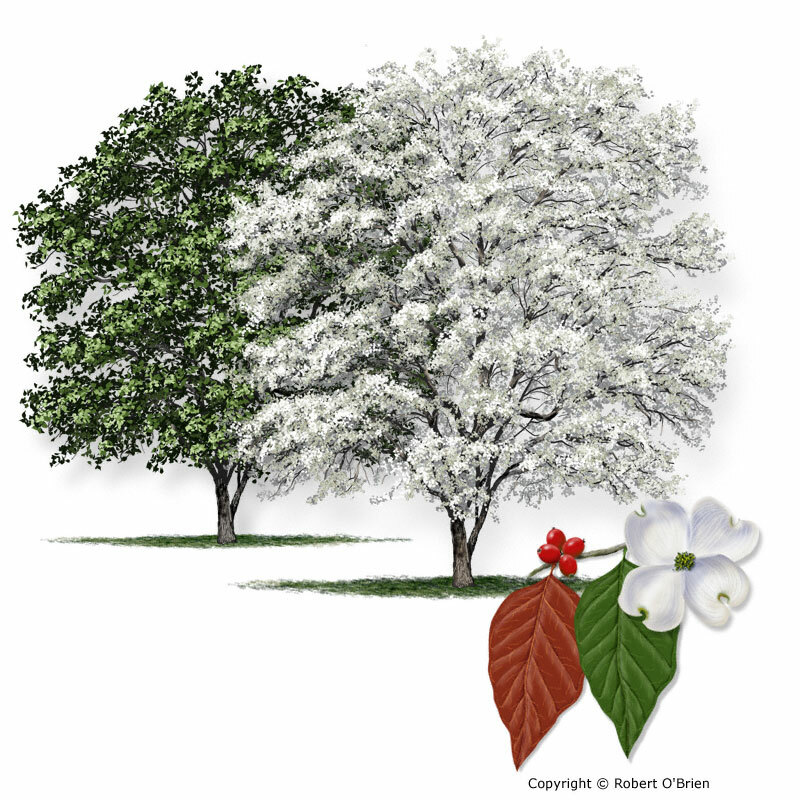 Thus, the dogwood tree is today a small, understory tree, which coincidentally blooms at Easter time most years.